Caroline Laguerre-Brown was named vice provost for diversity, equity and community engagement, University President Steven Knapp announced at the Board of Trustees meeting on Friday. Updated: May 16, 2016 at 9:58 a.m.
After eight months, officials have hired a new vice provost for diversity, equity and community engagement, University President Steven Knapp announced at the Board of Trustees meeting Friday. Caroline Laguerre-Brown, who has served as the vice provost for institutional equity at Johns Hopkins University since 2010, will take over the role on Aug. 1. She will handle a role more focused on community service and will tackle issues for minority students that officials have prioritized over the past academic year. Laguerre-Brown will take over for Vanessa Perry, who has served as the interim vice provost for diversity and inclusion since Terri Harris Reed stepped down from the role last September. Officials have shifted the role to concentrate on community engagement as well as oversee the Title IX office and disability support services. 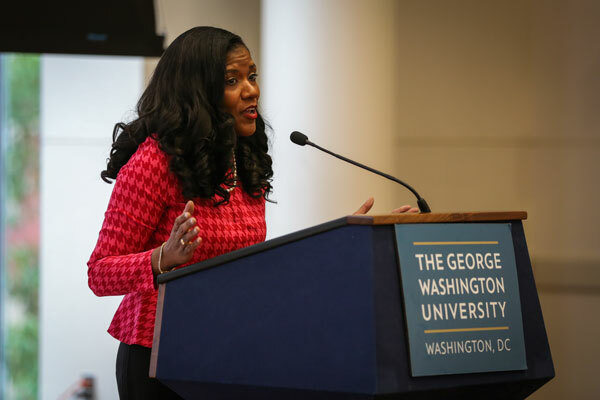 She is the fourth high-ranking official to come to GW from Johns Hopkins University since Knapp left his provost position there to become University president. Laguerre-Brown added that the different positions she has had in her 11 years of working in higher education have allowed her to become an advocate for social justice and inclusion. She said that she added resources for disabled students and created a plan for increasing faculty diversity at Johns Hopkins University. She also worked for the New York City Transit Authority, and she dealt with sexual harassment at the New York Fire Department. Laguerre-Brown said during her time at Johns Hopkins University, she worked with Knapp when he was the provost, and his “long-standing interest in diversity” and the strong team in the Office of Diversity and Inclusion led her to apply for the position. Knapp said at the board meeting that students have become more open about their experiences on campus as a result of the Black Lives Matter movement and the spotlight on sexual assault prevention. He said he met with student leaders of multicultural student groups to discuss their student experiences last fall. Knapp added that he took part in similar discussions with students and faculty across D.C. universities to understand the steps faculty and staff need to take to improve the campus environment for minority students. Interim Provost Forrest Maltzman said he wants Laguerre-Brown to focus on incorporating the Center for Civic Engagement and Public Service into the role as the head of diversity efforts “to enhance our understanding of diversity through civic involvements.” He said he also hopes she will make the Title IX office more accessible. Maltzman added that an inclusive campus climate is especially important for recruiting and graduating students from underrepresented populations. “Part of it – a good piece of it and one of the things she’ll be doing a lot of – is training for faculty and staff as well as students, so that people can live in a diverse community, which many people have not grown up in,” he said. Student Association President Erika Feinman also said at the meeting that annual diversity and inclusion training for faculty and staff was one of their goals for this upcoming year. Members of the SA executive cabinet were required to go through diversity training this year after a controversy over funding for the South Asian Heritage Celebration. “We feel that with such training our faculty and staff will be able to meet needs of students,” Feinman said. Darnell Cole, an associate professor of education at the University of Southern California whose research focuses on diversity in higher education, said having someone like Laguerre-Brown, who is educated in both university policy and the law, is key in her role. J. John Harris, a professor of education at the University of Kentucky, said any changes to a university’s environment have to be embraced, not only by the individual in the role, but also by the larger University community. But he added that having dealt with diversity issues before will likely make the process easier for Laguerre-Brown. The Hatchet incorrectly reported Laguerre-Brown dealt with sexual harassment in the New York Fire Department when she worked at the New York City Transit Authority. They were separate jobs. We regret this error.